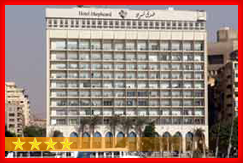 The Shepheard hotel is a modern 4-star hotel ideally located in downtown Cairo, close to the Egyptian museum and the Opera House. Situated on the banks of the Nile, 300 guest rooms and suites including 263 Stylish rooms, 5 Disabled rooms, 23 Unique duplex (3 levels suites), 8 corner suites, 1 presidential suite. The 410 rooms and suites are furnished with ornaments and artwork of the Pharaonic period as well as additional amenities for a memorable and comfortable stay. 12 senior suites,18 junior suites, 24 connected rooms,6 executive rooms,12 non-smoking rooms, 3 handicapped rooms and 335 standard rooms. 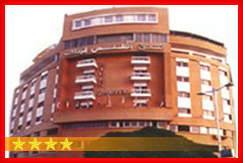 Grand Pyramids Hotel is located in Cairo, and is quite close to the pyramids. The property is approximately 20-minutes drive from Old Memphis and Sakkara. The Citadel Fortress, Khan el Khalili Bazaar, and numerous places of interest are in the immediate vicinity. 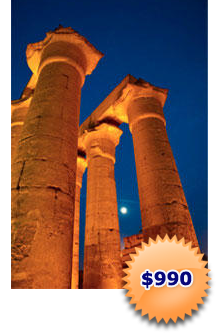 The hotel is around 7 km from the Egyptian Museum, and is 5 km from the nearest train station Giza. Grand Pyramids Hotel has 238 rooms spread over 7 floors. 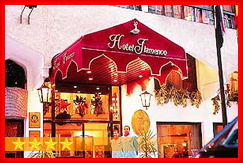 The rooms are beautifully decorated and provide modern facilities to please business and tourist travelers. 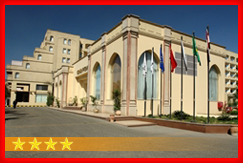 All rooms are spacious and air conditioned, and are equipped with direct dial telephone and satellite TV. The rooms come with private bathroom, minibar, shower, radio, bathtub, make-up mirror, dressing table, safe, wardrobe, fridge, and balcony. Some rooms have Internet connection and modem line. 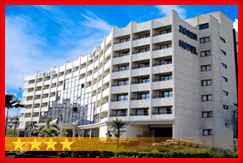 The Golden Tulip Hotel Flamenco is a modern, deluxe, first class, international hotel, which offers guests the comfort of 157 spacious rooms and suites. Each room has a private bathroom, central air-conditioning, mini bar, direct dial telephone, color television with satellite channels. Walk into Atlas Zamalek Hotel and discover luxurious comfort in the hubbub of metropolitan Cairo. Discuss business or chat with friends and enjoy a nice game of pool. Relax in spacious bedrooms and suites with color TV, offering various satellite channels.